The harsh winds of winter are howling outside and rattling the windows as I write this post. When the snow is flying, it’s time to put another log on the fire and add romance to your home. 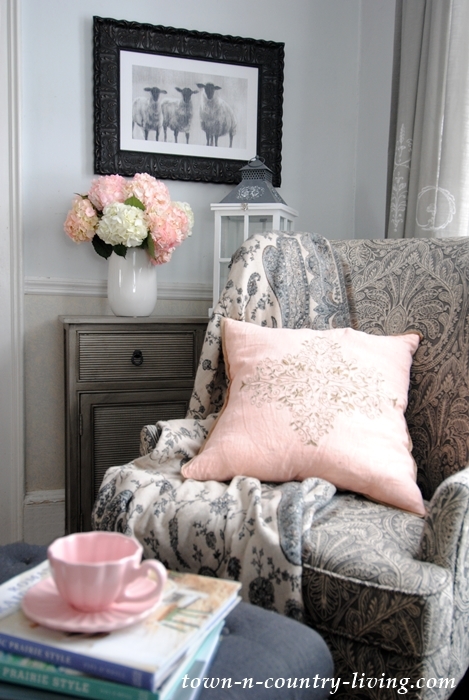 Soft textiles and pretty flowers are easy ways to create a romantic home. 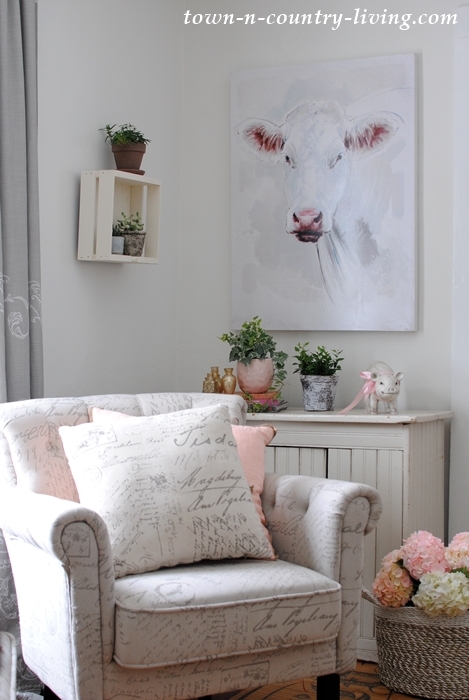 During the month of February I enjoy adding touches of pink throughout the house. Roses can be expensive so I like to mix large roses with smaller rose sprays that are less costly. 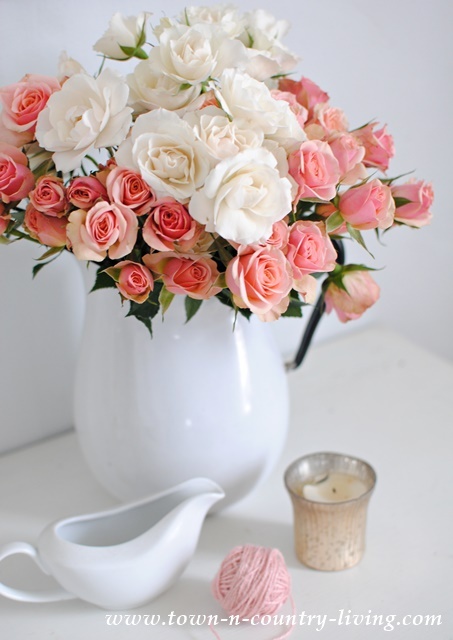 Varying shades of blush and pink roses always look good in a white pitcher or vase – especially if it’s vintage! 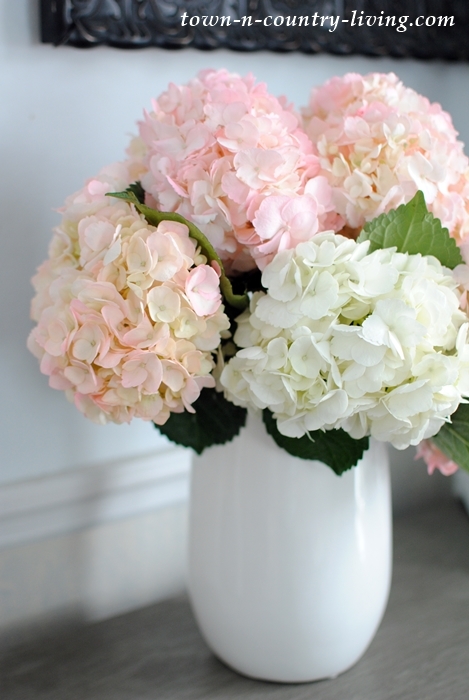 My entryway gets a touch of pink with a big pillow, a cute teacup, and a vase full of hydrangeas. 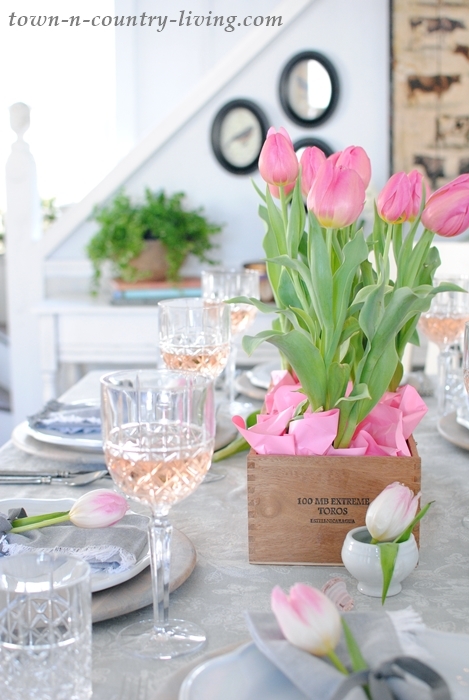 Create a romantic home by setting the table with pink tulips and soft gray napkins. I recently shared my pink and gray table setting for Valentine’s Day. The dining buffet also wears a soft and pretty look. 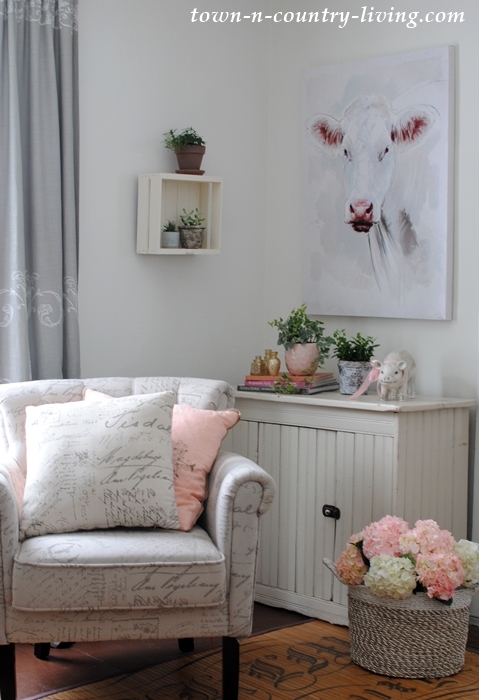 Last year I added touches of pink to the family room to create a little romance and shabby chic style. I love to add a bough of greens and flowers to the top of my French clock. Do you notice anything different in the sitting room? I swapped out the gray cabinet for the creamy white one that was in the kitchen. On Saturday I’ll show you why I had to move the little cream kitchen cabinet. The box on the wall next to Tulip the Cow is also a new addition. 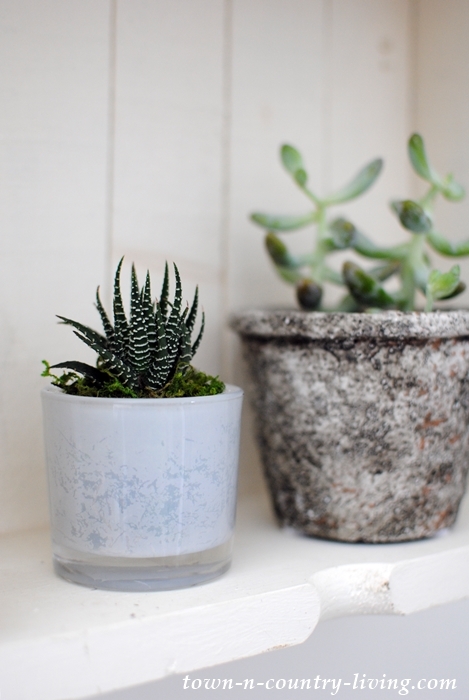 The painted shadow box holds tiny succulents. Miss Piggy wanted to join the romantic home fun so I gave her a pink bow. 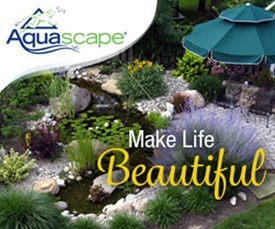 Besides flowers, an easy way to create a romantic home is to swap out your planters. 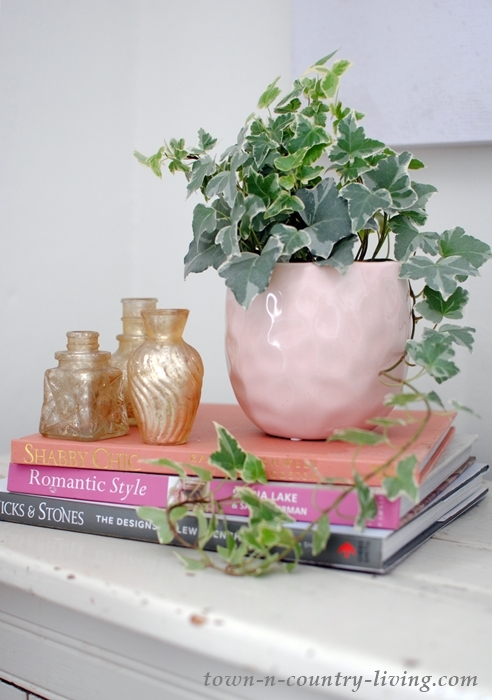 My green and gray ivy with its pretty leaves gets a new pink pot. 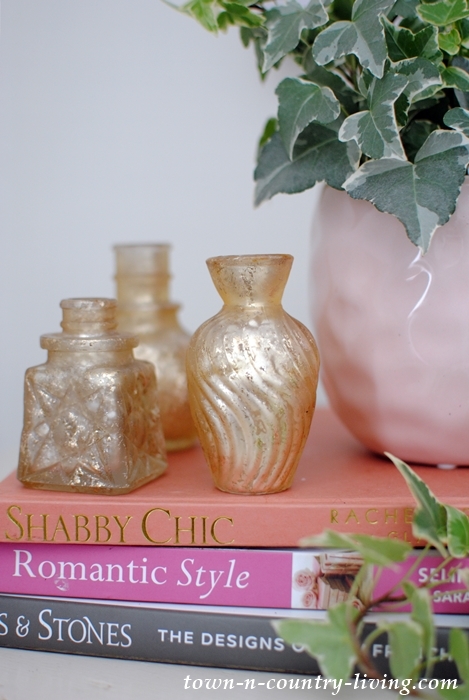 A collection of tiny gold vases adds a touch of glam atop a couple books devoted to romancing the home. 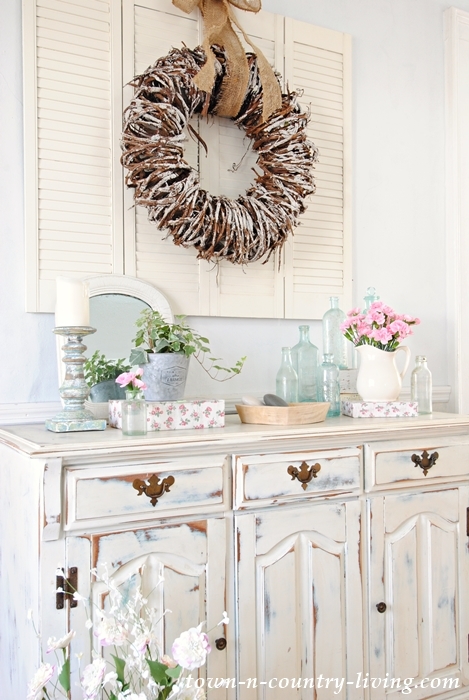 If you’re feeling a case of the winter blues, add a little cheer by creating a romantic home. 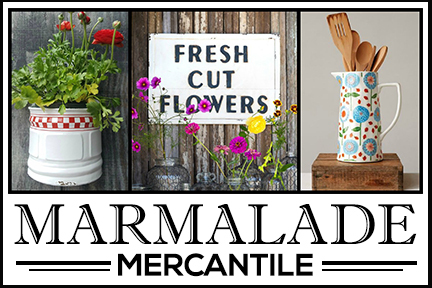 The days are getting longer and February is a short month – spring will be here before you know it! What are some ways that you like to add a little romance to your rooms? OK, you’ve inspired me to embrace February. I was still kinda stuck in early winter mode. I also have to tell you that your featured home designed by Anthony Baratta was so amazing in detail that I went to his website and left a comment regarding his design genius. Believe it or not I received the most wonderful response back from him. It made me realize how these fabulous, famous designers are real people too! 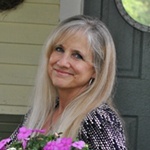 Thanks for bringing them and their talents into our homes and lives, Jennifer. YOU are amazing! Absolutely LOVE ❤️ the pink. It looks fabulous! Very inspiring. I live in Florida and I’m SO ready for Spring, LOL, I can’t imagine what it must be like for you! Your pink and gray color palette is so warm and cozy and springy and uplifting all at the same time. I’ve come to realize that I have absolutely no pink in my home and that needs to change. I have a bathroom I’m very tired of and they say that a soft pink paint on the walls makes a person look much better when looking in a mirror in harsh bathroom light. I’ll take all the help I can get. I think I just talked myself into yet another project. Yikes….. I love all the pinks you have added, and Miss Piggy is exceptionally lovely. It’s nice some days when you walk though the door you have a place to set, at least when you get through shopping, lol!!! 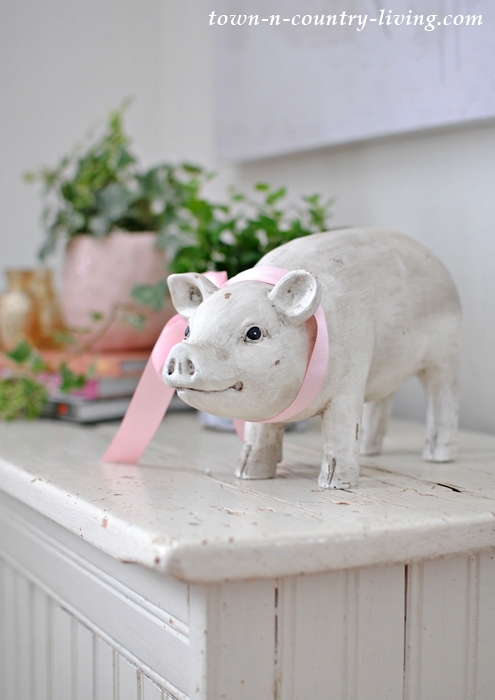 so pretty, of course Miss Piggy needs a bow! 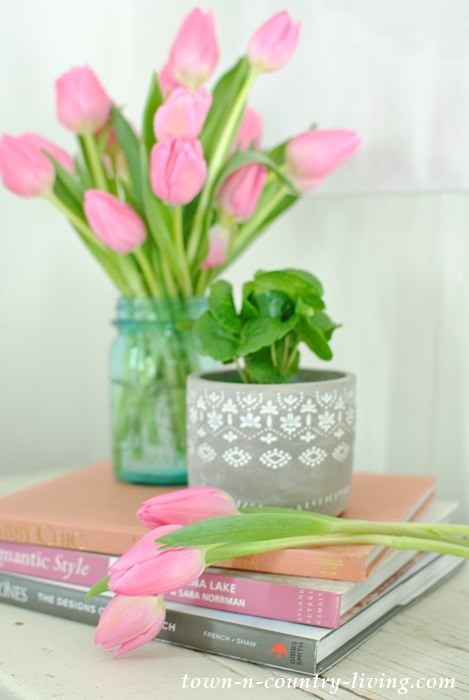 LOVE those amazing bright pink tulips that brighten up the scene! 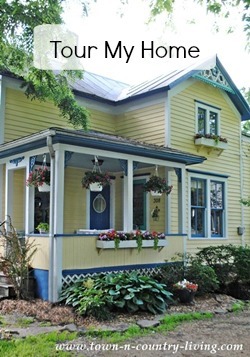 I enjoyed reading and seeing how you bring romance to your home. The touches of flowers along with the colors of spring was inspiring. Your pig is way too cute! Thank you for the tour! 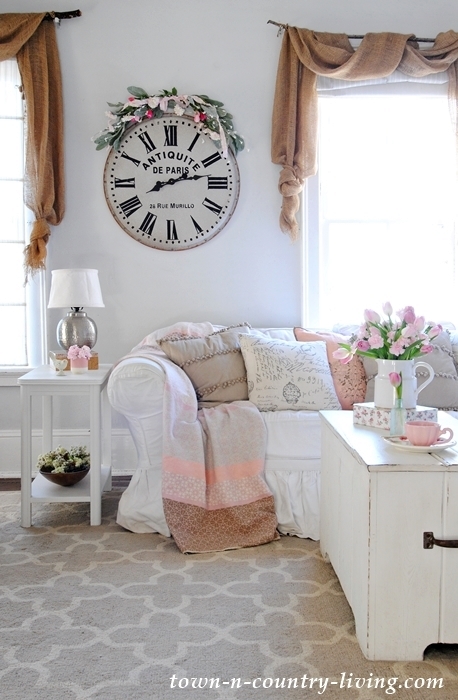 What beautiful ideas to add touches of Romance and spring this time of the year! Thanks for all the inspiration!